Here is one of the best reasons to visit Brazil; if you don't try a batida you'll never know what you're missing! Batidas are heavenly mixes of fresh fruit juice and cachaça—the potent sugarcane liquor from Brazil. Usually, the recipe will also call for "leite condensado" (sweetened condensed milk) and/or other liquor. They are prepared in a blender and served in tiny glasses, with crushed ice added. Batidas, like caipirinha, can be prepared with vodka or, if you're feeling adventurous, sake. 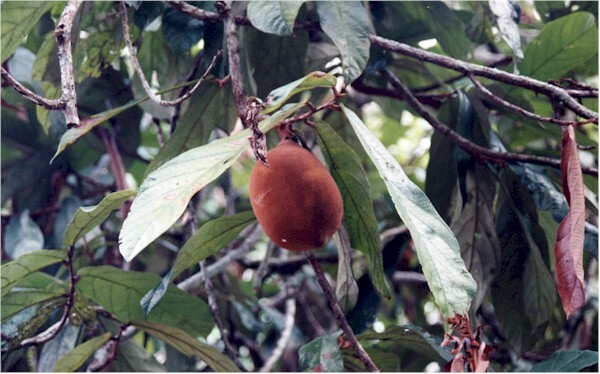 The most common batidas are made with passion fruit (batida de maracujá), cashew juice (batida de caju), and coconut milk (batida de coco). Fortunately for us, residents of these northern latitudes, these juices and the coconut milk can be found in Latin and Oriental grocers. If you can find the small bottles of Brazilian coconut milk, grab them. It's great stuff. Batidas frequently have humorous names like angels' piss, virgin's sweat, monkey's milk, etc. Enough intro, here are some great recipes I've tried over the years, courtesy of my good friends in Rio and Salvador da Bahia. Oh, and keep checking back with us, we will be adding new recipes from time to time. 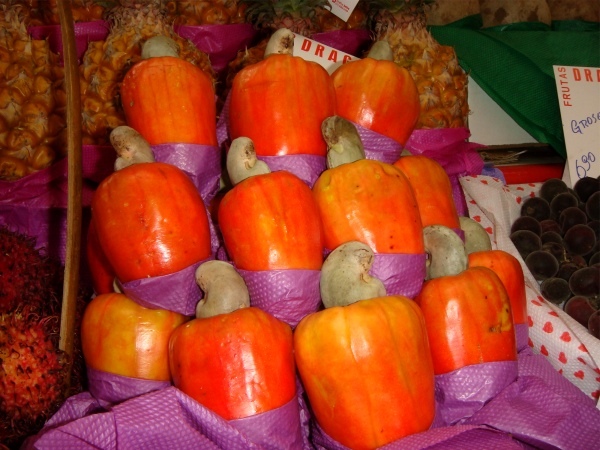 For more pictures of Brazilian fruits, try our Sherbets and Juices Pages. The first two recipes were given to me by the barman at Hotel Tropical in Manaus. Frozen cupuaçu or soursop pulp can be found at Brazilian markets in Miami. Shake and pour. The table cream, which is considerably thicker than what we call heavy cream, can be found in most supermarkets. 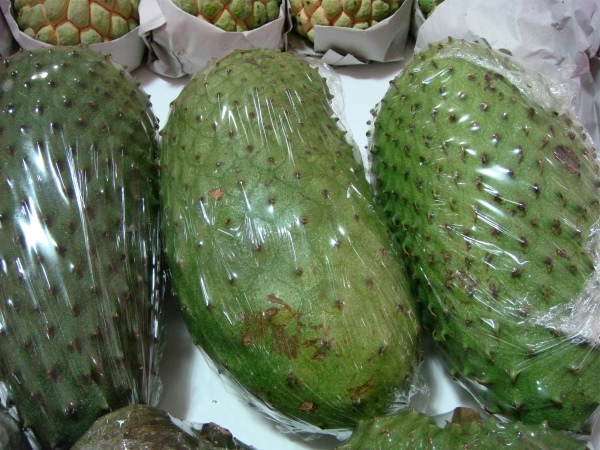 Frozen soursop (called guanábana in Spanish) can be found in the Latino or Ethnic section of your supermarket. 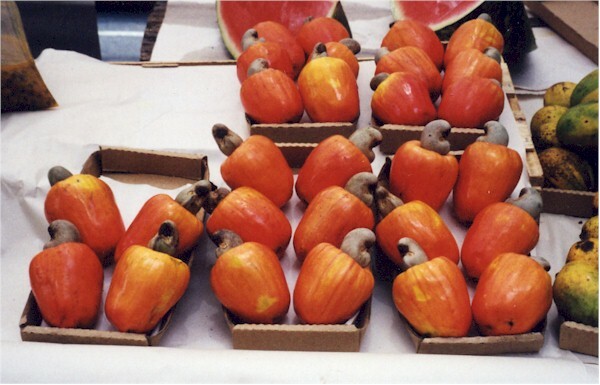 Frozen cupuaçu pulp can be found in Brazilian markets around the U.S. Shake or blend and pour. Blend until smooth, add crushed ice and serve in tiny glasses. 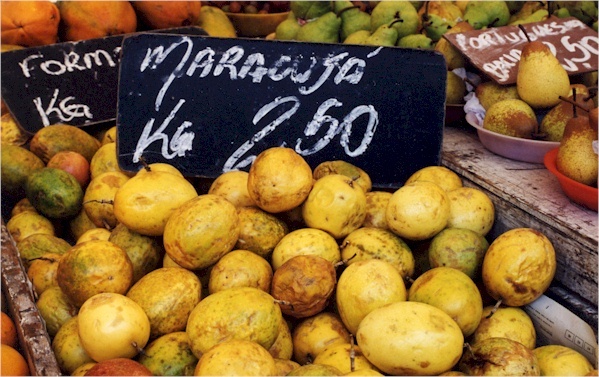 For each measure of cachaça, use 1/2 of maracujá juice. Add sugar and crushed ice to taste, mix and serve. Remember that passion fruit is very tart! You can also make it with fresh passionfruit spooned right out with seeds and all. In this case, add a sprig of mint and crush the leaves before you drink it. Totally delish! Same as above. Again, cashew juice is very tart; it's a great way to get your vitamin C.This batida is also called Caju Amigo (Friendly Cashew). The original Caju Amigo is a sip of cachaça followed by a bite of the fruit, but I don't know too many people who can do it, for obvious reasons. Blend until smooth, add crushed ice and serve in tiny glasses. Sprinkle each glass with ground cinammon, it looks and tastes great. This is a good one to make in the U.S. because we can use coconut cream or milk found in most large supermarkets. For each measure of cachaça use two measures of coconut cream or milk. Blend well and add crushed ice to taste. Yummy! Blend until smooth. Strain. Add sugar and crushed ice to taste. Major Tip: There's a bar/restaurant in the neighborhood of Leblon in Rio de Janeiro called Academia da Cachaça. It's a cute name — I don't need to translate, do I? Great place to try batidas and eat good Brazilian food (fantastic home made linguiça from Minas Gerais and escondidinho, an au gratin dish made with puréed manioc that "hides" the meats inside, hence the name). 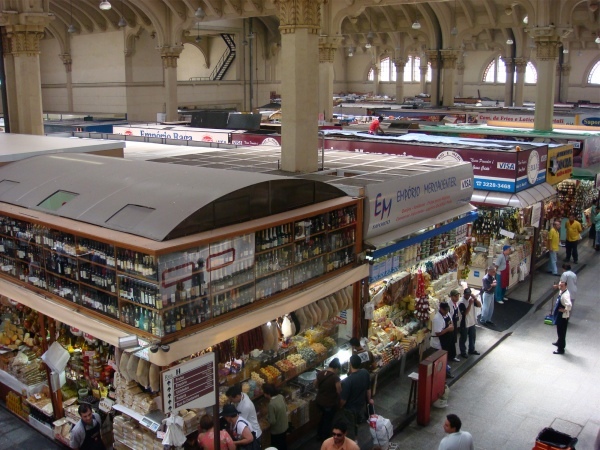 These guys stock over 2,000 different brands of cachaça. Have someone call a taxi to take you back to your hotel! Downtown Rio, THE place for cachaças (and live music) is Cachaçaria Mangue Seco, Rua do Lavradio, 23, across the street from Rio Scenarium. The selection from Parati and Salinas, Minas Gerais, is quite amazing, plus they seem to carry every cachaça produced in the state of Rio, too.